Home / featured / Opinion / Patrick Olliffe / Politics / Does the expulsion of Suzanne Evans mean the end for UKIP? Does the expulsion of Suzanne Evans mean the end for UKIP? Early this month we saw the next bloody chapter in the purging of UKIP’s former Deputy Chairwoman and Welfare Spokesmen Suzanne Evans. Ms Evans was Suspended from the party last week on grounds of “disloyalty” and bringing party into “disrepute” by criticising a fellow GLA (Grater London Assembly) Candidate. The Candidate (Alan Craig) in question she criticised, by way of singing a petition to have him removed from the London list, had compared gay people to Nazis. The real underlining reason why many people think she was suspended was for supporting the Vote Leave organisation over Grassroots Out ,both organisations support and campaign for Britain to leave the EU. Grassroots Out (GO) is the organisation UKIP leader Nigel Farage has backed for the official designation for the Leave side and apparently sees Suzanne Evans support for Vote leave as “Disloyalty”. However this will come as no surprise for people who have followed Nigel Farage’s leadership story since the General Election last year, which was a bitter-sweet night for UKIP. It is quite apparent that his leadership of the party that night, when he resigned and un-resigned, took a slight wobble. After that morning in Thanet when Mr Farage stepped down, Ms Evans was placed as interim leader by Nigel Farage when he was unsuccessful in his bid to get elected as an MP in South Thanet. However, she was quickly and swiftly demoted after an interview on the daily politics where she said: “Nigel is a very divisive character in terms of the way he is perceived. He is not divisive as a person, but the way he is perceived in having strong views that divides people”. After this comment was made a leaked email was seen from UKIP’s Press Office giving the directive that Ms Evans had been sacked from her role as Media Spokesperson and not to have contact with her. However after this was discovered, the party put out a statement saying the email had been put out without authorisation and she had not been sacked. Apparently Ms Evans was in the clear. At that point in time she was commended for her work in writing UKIP’s Manifesto, in which Mr Farage said it was the best he’d ever read. Also she was considered by many the female face of party and Farage’s future successor as leader. Ten months later however their seems be a very different story. Since that interview on the daily politics she has failed in her bid to become UKIP’s Mayoral candidate for London, a bid where she says in the process “she did not put a foot wrong”. She has been seen to side with UKIP’s only MP Douglas Carswell, who has called for Nigel Farage to stand down in the past, in backing the Vote Leave organisation where Nigel Farage backs GO (Grassroots Out). Also she was recently Sacked from her role as Deputy Chairwoman and Welfare Spokesperson, and of course the latest, being suspended from the party. 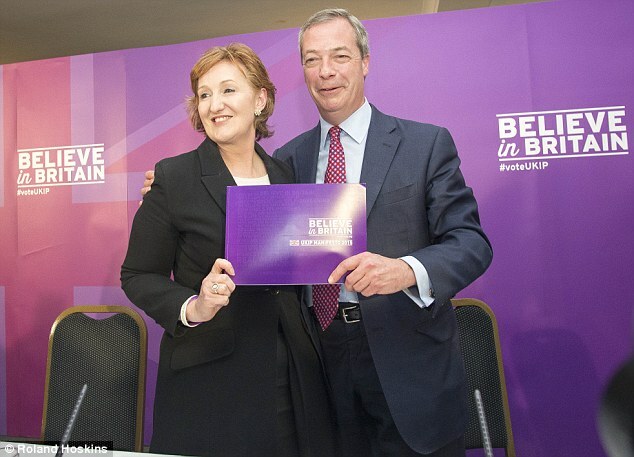 If UKIP is to continue after the EU Referendum as serious contender in Britain’s political landscape it needs someone like Suzanne Evans to champion it. Farage has said himself that he is a “marmite” figure and although he is extremely popular in the eyes of the people he attracts, he us as equally unpopular in the people he doesn’t. What UKIP really needs is someone who can attract and speak to people in the political centre. However it needs to do this without losing its core vote in the message and appeal it has to people already, the sort of “anti establishment” and “different from the other party’s” sort of message. Nigel Farage’s party may regret the expulsion of Suzanne Evans, If it wants to poll higher than 14% it needs to be seen as a progressive, democratic party and what it currently looks like in terms of this story Is a dictatorship.